This week we have finished the Nutshell integration. The integration allows you to work more effectively and saves your time. I would like to introduce the Nutshell CRM first. 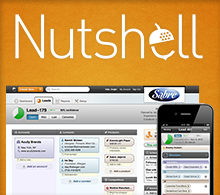 Nutshell CRM is a modern, web-based application to help manage your business's leads, contacts and accounts. It features a smooth, easy-to-use interface, powerful process management tools, and a mobile app. Insightful reports make it easy to track your leads and your sales reps' activities.